Graffiti and street art have often been the stars of surface investigations only because they were made to leave their surfaces behind: de-contextualised, they became objects of aesthetic interest, whose formal study became the focus of many projects and publications. Wildstyle graffiti exuberance, stencil witticism, sticker museums, tag police archives and online mural repositories – they are all based on separating the objects into classes and removing them from their places, detaching, isolating and abstracting them. This special interest not only ignored the significant places of graffiti and street art, but it also glided over the myriad undetermineds, the signs of ambiguous conviction, the strata upon strata of markings which occupy surfaces and signify together. The more guests you welcome to the surface party, the harder it is for graffiti and street art to steal the spotlight. What becomes interesting instead is the mingling, the dynamics, the affinity and dislike between inscriptions, their layering and co-habitation. It is true that graffiti and street art brought us here (and they make the focus of the following chapter), but the more we widen our field of vision, the more other curious extras can join in. 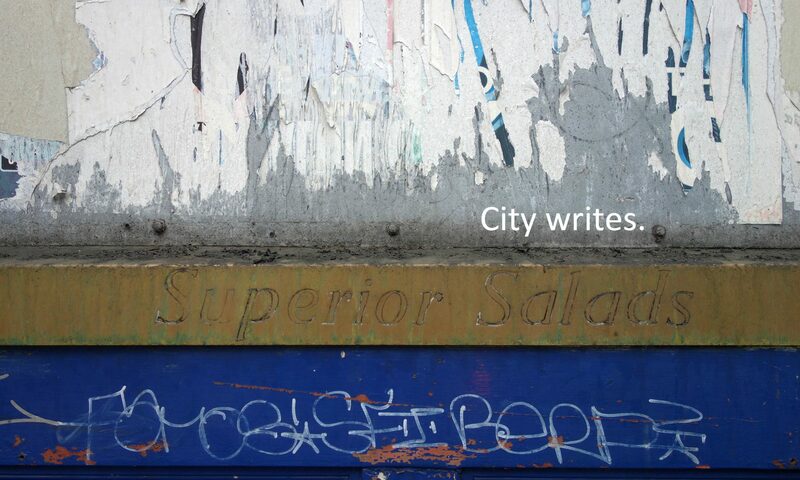 The brash spectacle of surface inscriptions displays text and colour, form and language, figure and texture, and demonstrates all kinds of urban manners. The spectacle of inscriptions is the spectacle of the city itself, with its multitude of voices and their changing arrangements.